Modi's cyber group is on rampage to create a 'Man of Development' Image of Narendra Modi. The Mastermind of 2002 Gujrat Riots has is seen to speak regularly on diverse topics more vigorously as elections are approaching. Meanwhile we have found that a research of NSSO indicates a stark difference between claims are facts. 'Salaried men in Gujrat' are most poorly paid in Gujarat! While the national average is Rs. 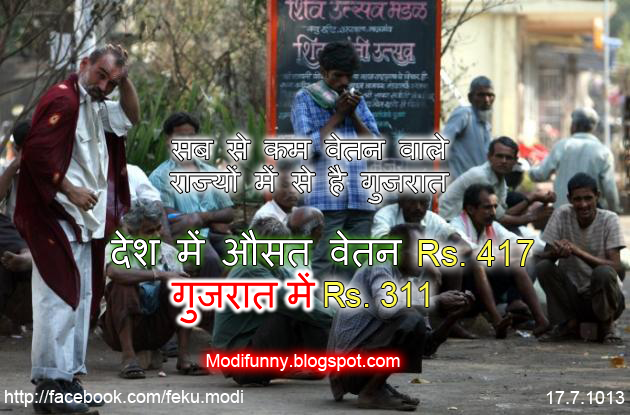 417, a common salaried man in Gujarat gets no more than Rs. 311. To add up to this a salaried woman gets only Rs. 241 while the national average is Rs. 307. The people working in rural areas gets only Rs. 115 while national average is Rs. 149 The photo below which has gone viral on the internet indicates this stark difference of Development for the sake of Riches. If you liked the facts presented here in, please like our facebook page.